Free Burger on Next Visit when Lunch Orders are Over 15 Minutes at Gourmet Burger Kitchen 15 minute lunch guarantee, Monday to Friday til 5pm! All Rounder - Classic Burger, Small Fries, a Fresh & Fizzy for £9.95 at Gourmet Burger Kitchen Available after 5 pm! Gourmet Burger Kitchen is a UK-based restaurant chain which specialises in gourmet burgers. The company began in London in 2001, and was founded by New Zealanders Greg Driscoll, Adam Wills, and Brandon Allen. Also from New Zealand, London-based chef Peter Gordon helped take the wishes of the Kiwi team and turn them into the most delicious burger menu on the high street! GBK offers delicious burgers to suit all tastes, a selection of meats for the meat lover and a variety of veggie options will make sure no one is left uncatered for. Although the company was founded and has so far only owned locations in the UK, when you visit a Gourmet Burger Kitchen restaurant you will notice a subtle Kiwi theme, in reference to the New Zealand heritage of the founders and original owners. How do I use my GBK voucher? 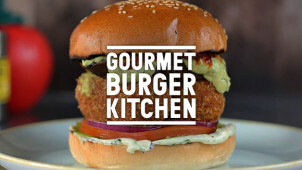 Go to the Gourmet Burger Kitchen website and book a table at your local GBK restaurant. When you arrive at the restaurant, be sure to let your waiter know that you plan to pay with a vouchercloud discount code. They will then be able to let you know if there are any exclusions from the offer and it will be easier for them to process the discount. When you get the bill, present your waiter with your discount code. If you’re planning to dine at GBK with kids, then you’ll love the handy Junior Menu. With tasty burgers and bites small enough to keep your little ones full and happy, it’s also great value with a burger, drink and side included for just £6.95, with the additional option of a dessert for an extra £1. Where is my nearest GBK? Finding your local burger kitchen is an easy task when you visit GBK online. Just type your postcode or town in the Restaurant Finder, and it will reveal where in your town you can grab a gourmet meal. When does Gourmet Burger Kitchen open? Opening times for Gourmet Burger Kitchen restaurants can vary by location. If you would like to find out the opening times for a specific GBK restaurant, you can use the handy restaurant finder tool on the site which will bring up all the information that you need. Does Gourmet Burger Kitchen cater to special dietary requirements? Yes. Along with providing vegetarian options, GBK also offer a gluten-free menu and provide allergy advice for all of their dishes. If you have a specific dietary requirement and will need the restaurant to make changes to your food, simply leave a note when booking or let your waiter know when you arrive and they will be happy to help. You can also find the nutritional information for your food on the Gourmet Burger Kitchen website. If you’re a fan of burgers, then you need to visit Gourmet Burger Kitchen. When it comes to restaurants and burger joints, this one is the king, of delicious and high quality fresh food. After all, why settle for a plain and ordinary burger, when you can now enjoy a freshly-made, gourmet burger for less with your GBK voucher! With every burger made to order and served with sumptuous sides and thirst-quenching drinks, it’s the perfect place to go for a tasty treat. Gourmet Burger Kitchen customers can benefit from downloading their free app, which is available at the iOS App Store and on Google Play. Downloading the app means that you’ll have exclusive access to great burger rewards, promotions, fun challenges, and the latest news from GBK. And, if you want your burger freshly made whilst you’re in a hurry, the app also allows you to order your favourite meal to collect from your local Gourmet Burger Kitchen. For a fool-proof dining experience and a burger that you’re sure to love at a reasonable price, you really can’t go wrong with the ‘Classics’ at Gourmet Burger Kitchen. Bring a friend and our GBK offer and you could get 2 for £12, 2 for 1 or save on your bill total! With options to suit all kinds of customers including beef, chicken, cheese and veggie burgers, GBK is the ultimate gourmet burger dining experience.